I love the smell of freshly baked bread. 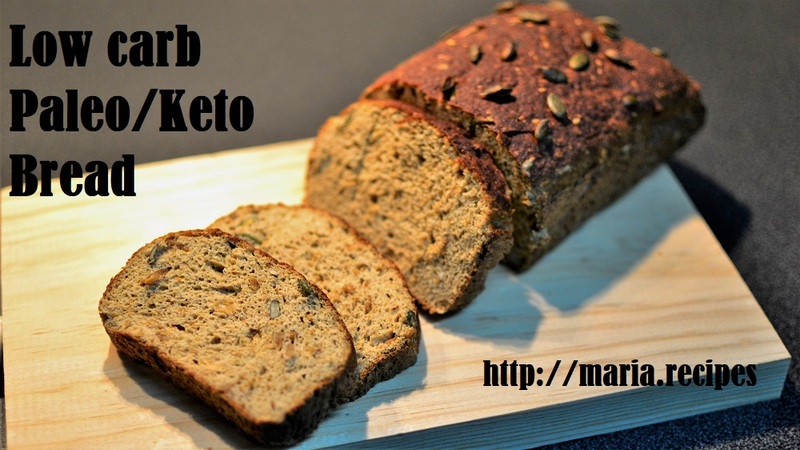 But most low carb breads don’t use yeast, so the smell and texture is not quite as good as traditional bread. That is why I was so psyched when this recipe worked out! The smell while it bakes is amazing, and the texture is perfect for toast or sandwich. Definitely worth a try! If you only have active dry yeast in hand, remember to use a little bit more (1.5 tbsp) and dissolve it first in a little warm water and let it activate for 5-10 minutes. Mix the dry ingredients in a bowl: flax meal, coconut flour, salt, baking powder, psyllium husk, xantham gum and active dry yeast. Mix well to make sure there are no lumps. Mix the eggs and eggwhites in a bowl. Then mix the dry and the wet ingredients for 2-3 minutes; you should end up with a dense and sticky mud-like consistency. Then, mix in the seeds. Warm up the oven to 250 C.
Once the oven is hot, put the bread inside and bake at 250C for about 10 minutes, and then at 180C for another 35-40 minutes. You can insert a toothpick to make sure it is cooked through. Let it cool down a little in the baking tin and, when cold enough to handle, transfer to a wire rack to cool down all the way before cutting into it. I love smoked salmon. It makes for some of the best salads ever. This is one of my favorite and easier combinations. Just a few ingredients and you get something simple and delicious! And if you want, you can fry the onion first, which will make it even yummier. I am absolutely obsessed with my Keto Chocolate Muffins, so I have been doing different versions, which has led me to this Marble cake, with coconut and chocolate. Delicious! Just like the chocolate muffins, this cake can be made in the microwave instead of the oven, so they are as easy as they can get! First prepare the mixture for the chocolate, following the muffin recipe. In the same fashion, in a separate bowl, make the coconut mixture: mix the flours, flax, coconut flakes, salt, baking powder and erythritol, separately mix the milk, stevia, eggs, vinegar, vanilla and oil, then mix everything. Check the consistency of both mixtures, if they are too thick add some almond milk or water. Take two spoons and use them to pour the chocolate and coconut mixes into the tin alternately, to form the “marble” look. Cook in the microwave all of them for 9-10 minutes, or in the oven for about 40 minutes at 180C. I have been playing around with Healthfulpursuit’s recipe, and I think I found the Final, Most Delicious version. 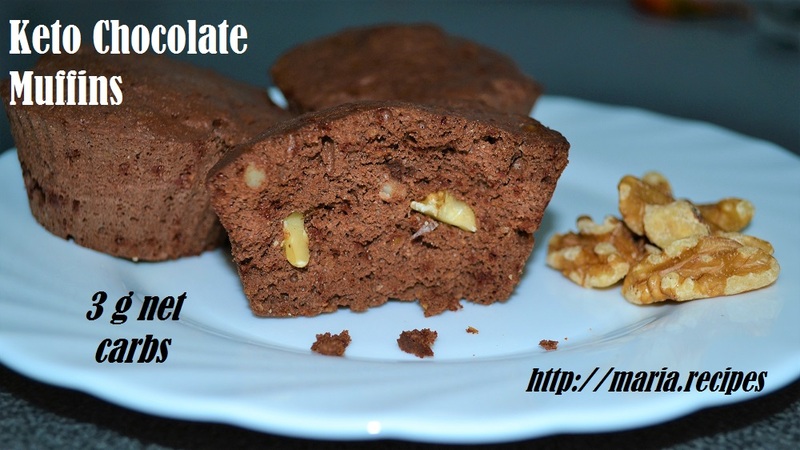 These chocolate muffins can be made in the microwave instead of the oven, which makes them so easy to make that you can have these for breakfast every day - believe me, that is exactly what I do! 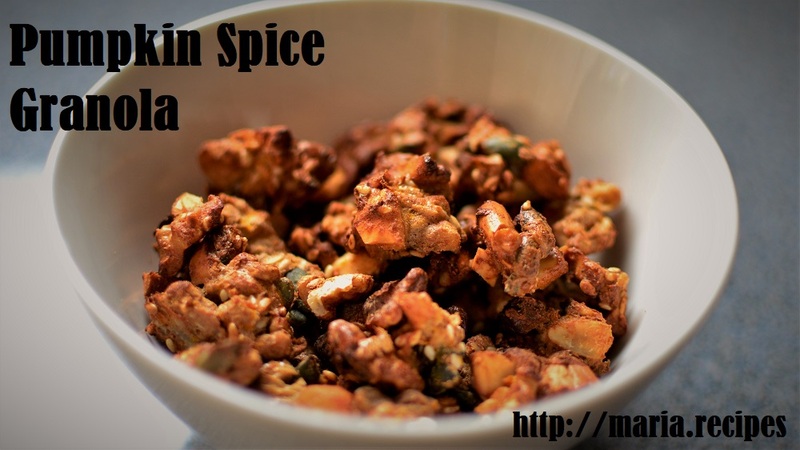 You can of course add a few other ingredients such as a bit of coffee, cinnamon, or even substitute the walnuts for macadamia nuts or almonds. First mix the coconut flour, flax, cacao, baking soda and salt. In a separate bowl, mix the eggs, oil, chocolate and vinegar. Then, add the dry ingredients into the wet and mix. Mix well and add the almond milk slowly to get a not-too-thick batter. Finally, add the chopped walnuts and mix. Divide the mixture into 6 muffin tins (for microwave or oven, whatever you prefer). Cook in the microwave all of them for 6 minutes, or in the oven for about 20 minutes at 180C. My favorite meal as a kid was, hands down, “Pollo en escabeche”: Chicken cooked in an oil and vinegar sauce, left to sit in the fridge for a few days for the flavors to be even better. 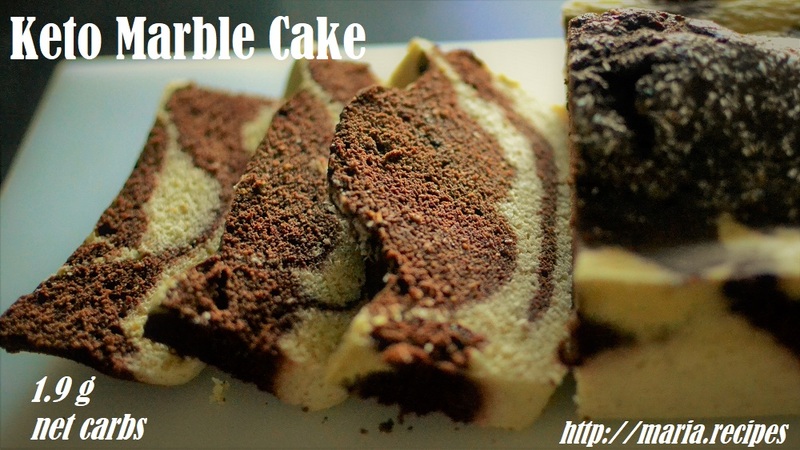 It is very easy to make and only requires a few ingredients. In this occasion I made it with tuna, but you can use the same amount of chicken breast, add one chicken stock cube and cook for a little longer. And if you aren’t a big fan of vinegar, you can substitute some (or all) of it for lemon juice (although it will have more carbs!). Mix all the ingredients in a saucepan and let it marinate for at least 3 hours, preferably overnight. 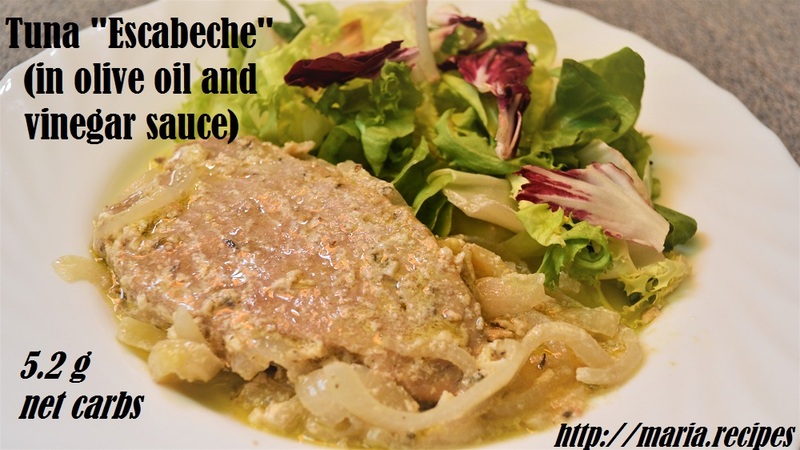 Try to use a small saucepan so that the tuna is covered in the onion and sauce (if it doesn’t cover it all the way it is ok, it will release liquid as it cooks). Scoop out the tuna and leave on the side. Then, put the saucepan over medium low heat, cover and, when it starts to boil, reduce to very low heat and cook for about 30 minutes, for the onions to soften. Add the tuna back into the pan, move everything around to ensure the tuna is covered, and let it cook for about 15 minutes or until no longer raw. Be careful, it overcooks very fast and you might end up with very tough tuna! Take it off the stove and leave it covered. Once cooled down, put in the fridge and let it sit there for at least 24 hours, and upto 1-2 weeks. 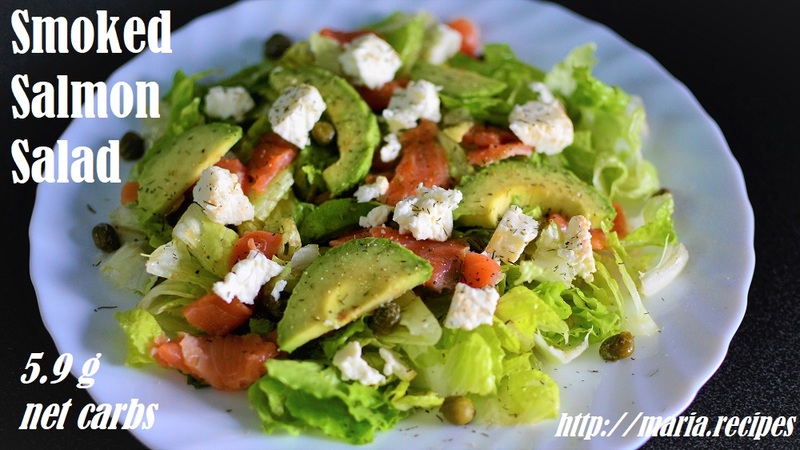 Serve cold or at room temperature with salad and/or with cauliflower rice. As I mentioned in other posts, I adore indian snacks - I always have so much trouble choosing appetizers at Indian restaurants! 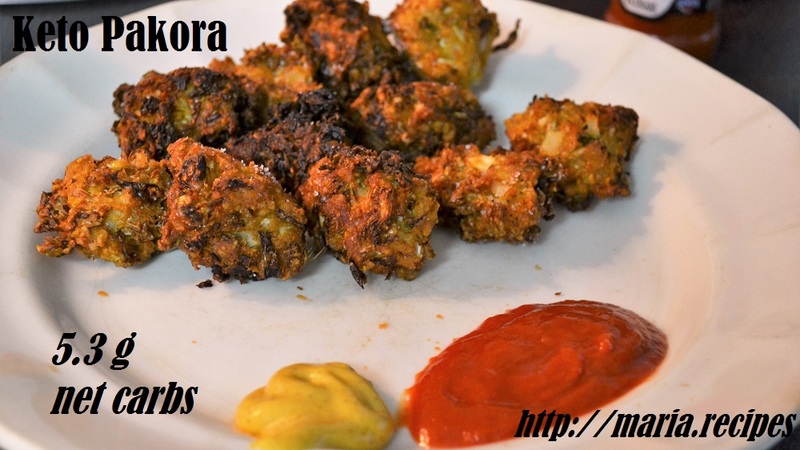 Last time I was at one, I had some wonderful pakoras, and I figured perhaps there is a way to make them lower carb… So these babies were born! 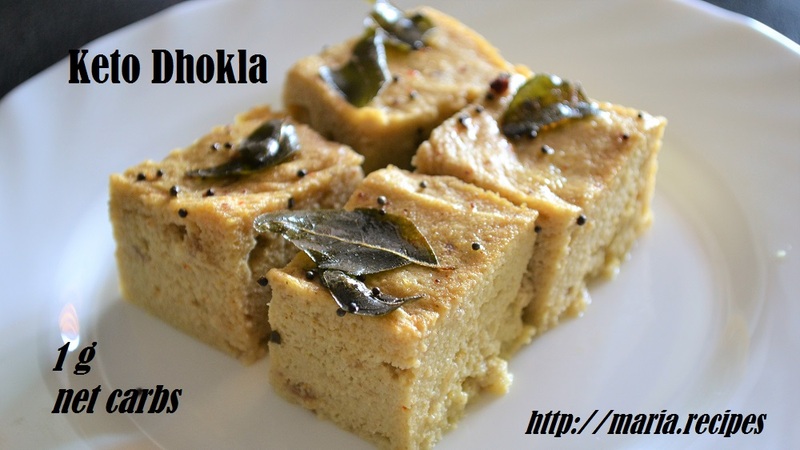 They still use some chickpea flour like in the original recipe, but in smaller amount to lower carbs. BUT - you can sub the flour for two eggs and just add less water later, no problem, and you will have extremely low carb pakora! 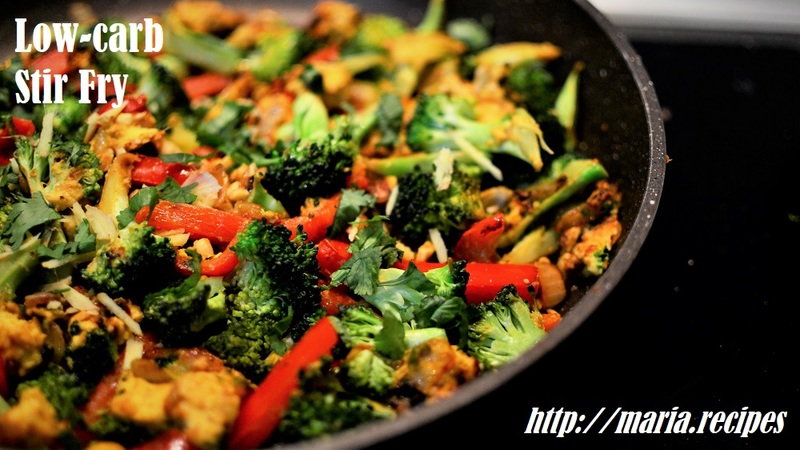 First, mix the vegetables with the coriander, ginger and spices. Mix in the chickpea flour and the ground flax. Add boiling water: start with 1/4 cup and work your way up until you have a mixture that you can form into balls. Warm up the coconut oil in a pan and cover a plate with kitchen towels. Use a tablespoon to scoop small amounts of the batter (I personally form them with my hand) into the hot oil. Fry for about 2 minutes until golden and crunchy all over. Then, put on the kitchen towels to absorb any extra oil. Eat with lots of spicy chutney! Indian snacks are amazing - but always full of carbs! 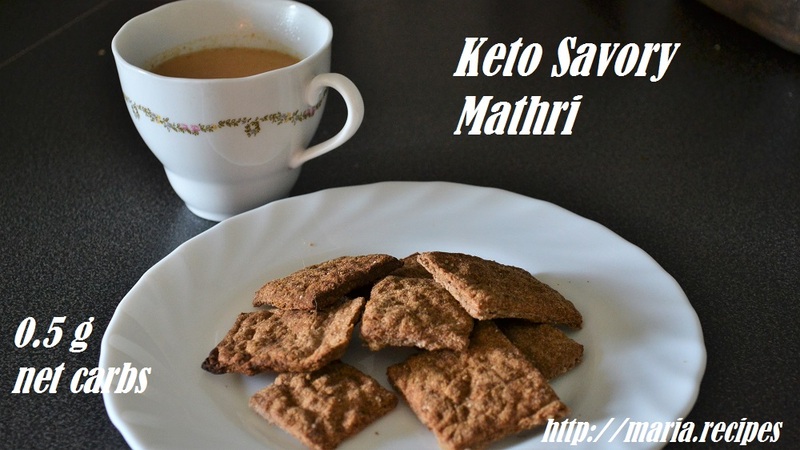 These crunchy, spicy crackers, however, are very low carb, at 0.5 g net carbs for two pieces. You can customise the spices to suit your preference (perhaps paprika and cumin, to dip in guacamole). Enjoy! First, melt the 1/8 cup of butter and then mix in the egg and vinegar. In a separate bowl, mix the dry ingredients and the spices. Add the wet ingredients into the dry and incorporate until you have a crumbly mixture. Now add the boiling water: start at 1/3 cup, then increase slowly until you have a slightly sticky dough. Knead for about 1 minute, then put onto a parchment paper. Use a rolling pin to make a 2-3 mm thick sheet of dough. Then, cut into pieces (I made 40). Melt the tbsp of butter, then brush it over the raw mathri. Sprinkle with some salt over the top and, optionally, some red chili powder. Bake at 180-200? for 35-40 minutes until they are dry and crunchy. If they aren’t crunchy yet, you can turn off the oven and leave them inside to dry out. 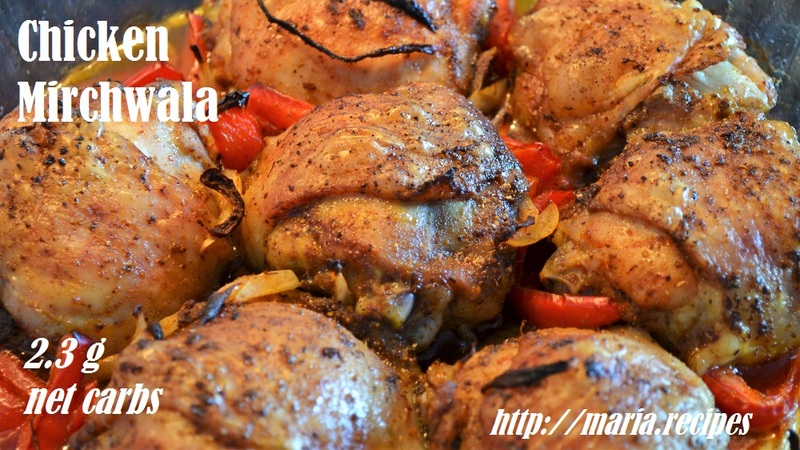 This one is my boyfriend’s creation: a roasted spicy chicken with spices and melt-in-the-mouth red bell peppers. Perfect for serving for guests - just add some fatty side dish and you will have the perfect keto meal! First, preheat your oven at 200ºC. Meanwhile mix the pepper and onion with the chaat masala. Alternately you can add a good pinch of salt, pepper and cayenne. In a separate plate, rub the chicken with the oil, then add the spices and salt. Mix well. In your baking dish, put a bed of the vegetables, then the chicken on top. Cook in the oven for 45 minutes, turn the chicken pieces around, and cook for another 45 minutes. Optional: about 15 minutes before you take it out, add some chana masala. Let it sit for 5 minutes, garnish with fresh coriander and serve. 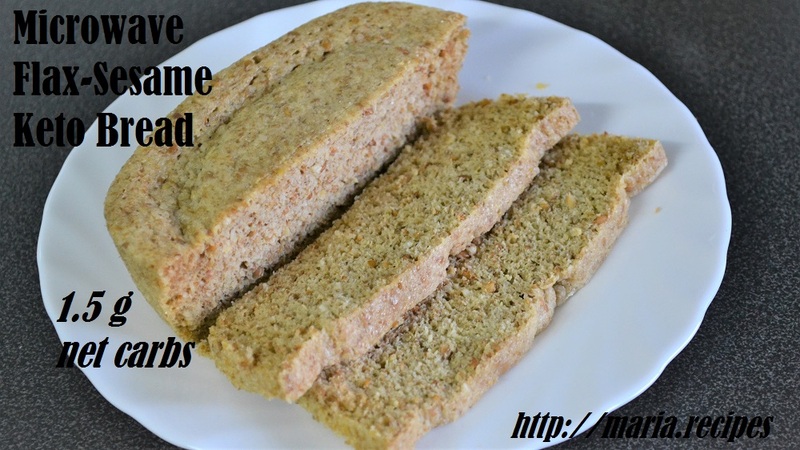 Microwave breads are a very common item on ketogenic diets. The most common ones, made with almond flour, are slightly expensive and higher in carbs, so I like to make mine with flax. However, flax has a somewhat… peculiar flavor. So I mixed it with sesame and got a wonderful result: when had on its own it still has a strong flavor, but it is perfect for sandwiches or toast. And of course you can add some garlic powder and herbs to make it extra aromatic. First, powder the seeds in a blender. Then, mix them with the salt, baking powder and psyllium husk. In a separate bowl, mix the egg, oil, 1 tbsp water and vinegar. Then add the seed mixture to it. You can use an extra 1-2 tbsp water if you need. It should have a thick consistency, like clay. Put the dough in a greased microwave-safe mold (or in 3 individual molds) and microwave for about 3 minutes or until it is completely set. Wait for it to cool down before cutting into it. 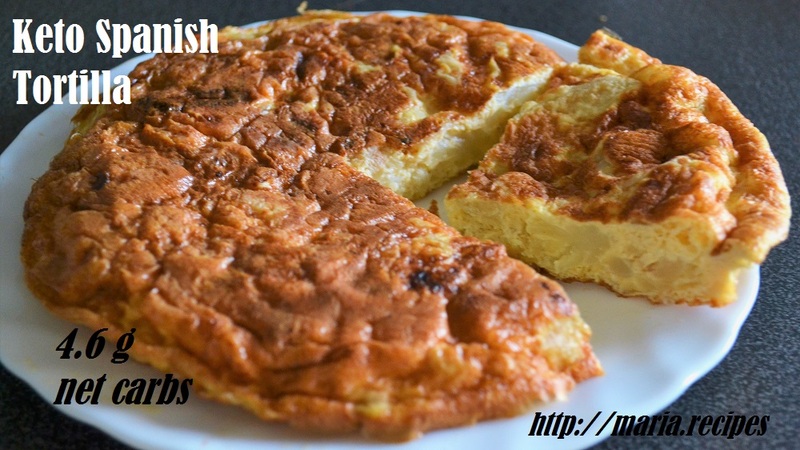 The “Tortilla de patatas” is one of the most popular spanish dishes: a thick omelet stuffed with potatoes fried in olive oil. 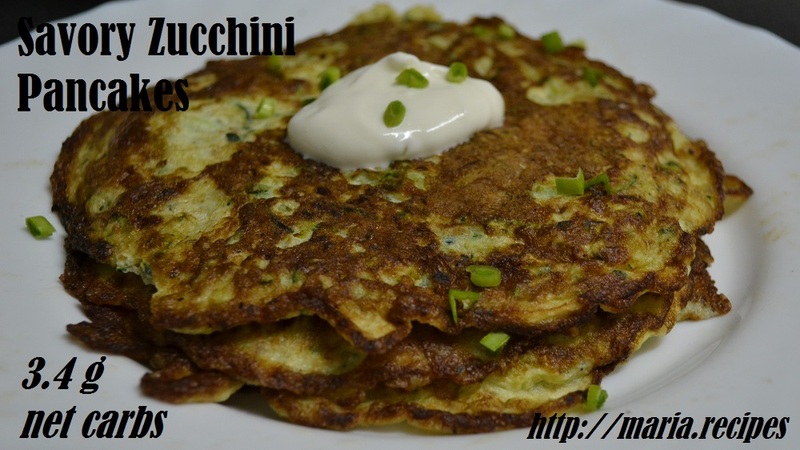 A truly delicious dish that I recreated with cauliflower, with amazing result! Serve it as a tapa, or have two servings for a great breakfast or lunch! And if you don’t have any small pans, you can simply double the recipe. Put 2 tbsp oil in a pan over medium heat. Once it warms up a bit, add the vegetables with salt, cover and cook on medium-low, stirring occasionally, until the cauliflower is fork-tender. Take the mixture off the heat and let it cool down a couple of minutes. Whisk the eggs with some salt, then add the cauliflower mixture. In a small non-stick pan of 20 cm diameter, put 1/4 tbsp olive oil (just enough to grease it) over medium-high heat. Then pour the batter, lower the flame to medium and let it cook (you can cover it so it goes faster). After about 2-3 minutes, when it is starting to look a bit more set (it will still be liquid in the top), turn it around by putting a plate on top (I recommend doing this over a tray in case it spills). Pour 1/4 tbsp olive oil on the pan and once it is warm, gently slide the tortilla back inside so it cooks on the other side for another two minutes. When I am feeling lazy in the warm summer evenings in Madrid, I make this. It is kind of a mix between an ice cream and granita, except it takes about one minute to make, and you can use coconut cream for a vegan version. I usually just eyeball it, so dont worry too much about the exact quantities. 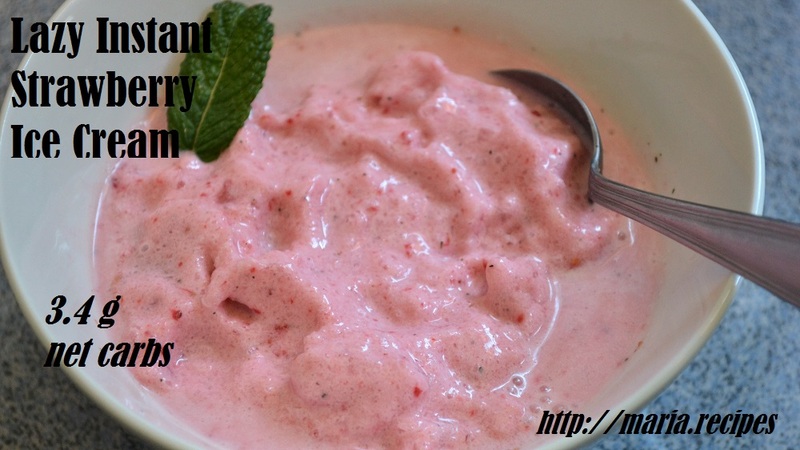 The ones I gave will give you more of an ice cream texture with a reasonable amount of carbs and calories, but you can increase the strawberries and cream for an even better result. Blend everything in a high speed blender. Mix everything except the oil in a bowl. You can save some of the green onions for topping. Warm up a teaspoon of oil on a non-stick pan over medium-high heat. Pour a quarter of the batter and cover with a lid. After about 1-2 minutes, when it is almost set, turn it around, cook for about 30 more seconds, then take it out and repeat with the rest.